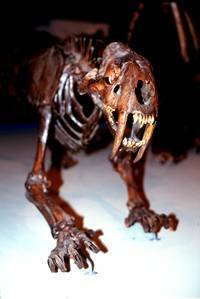 Saber-Toothed Cats, Prehistoric Cats, Saber-Toothed Tiger, Facts and Pictures. 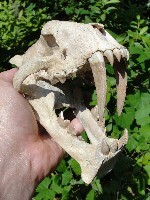 One of the best known icons of the Ice Age is the Saber-Toothed cats. There were many types of these extinct cats. 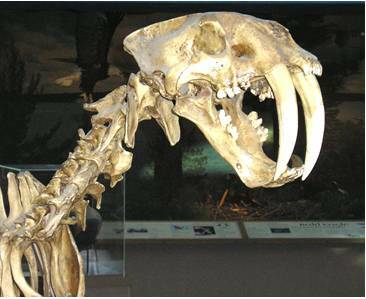 Sometimes referred to as “Saber-Toothed Tigers” they were about the size of a modern African Lion. They had short powerful legs and strong shoulders and were probably "ambushing" type predators. 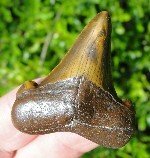 As their name indicates, they had long flat canines up to 7 inches (18cm) in length and were able to open their jaw extremely wide. 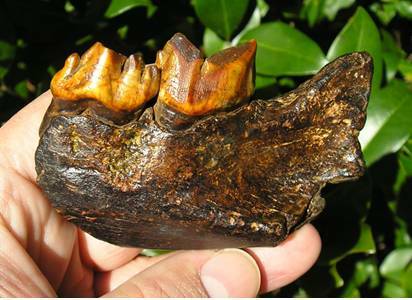 How these canines were used, has long been debated – as a dagger or a slicing bite to the throat or abdomen of its prey. Living from about 1.5 Million Years ago and going extinct about 10 thousand years ago. It's range was North and South America.